Why place Computers Ad in Mathrubhumi Newspaper ? The dependence on electronics has reached unprecedented levels in the present era. An entire section of ads have now been created to help serve people who deal with computers. 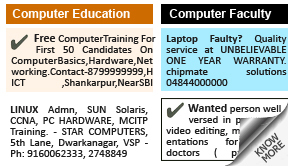 Under the computers section, individuals can advertise for their computer coaching classes, their hardware shops and to sell old computers. Book your ads and even pay online for your ads via multiple online & offline payment options. • Fresh imported used computers for lesser prices.COMPAQ, DELL, P3-Rs.2000/- P4-Rs.5000/- Contact: BLUECHIP Systems 22223434,23456789. How To Book Computers Ad in Mathrubhumi Newspaper ? 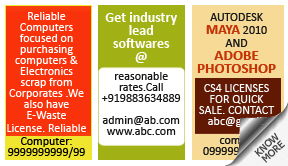 You can seek the help of our sample ads to compose your ad ably. Choose advertising date(s) and clear your advertising bill via a host of online & offline payment options. If you wish to book your ads immediately, you can do so by following the steps mentioned above. Alternatively, you can get to know more about Computer ads in Mathrubhumi by clicking on the relevant tab above.